We have a new principal at school this year. Change can be scary and hard at times, but change also brings great new things you never thought of before. 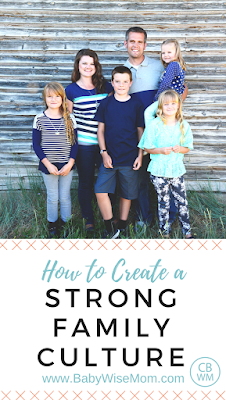 A new thing we have going on this year that I love is a weekly newsletter where our principal sends out little insights on how to create stronger families and help children succeed. Brayden started Jr. High this year, and his principal does the same thing, only monthly instead of weekly, so I am getting great little tips from two new sources. As an avid information junkie, I love these things! One topic was recently discussed that really stood out to me. Family culture. It was briefly discussed as important, but it got me thinking. How do we build a strong family culture? What things need to happen to create this culture? Why do we even care? First, let’s define. It is quite simple. Culture is basically what you do. There are many levels to a culture. You have your nation, your society, your religion, your politics, your town, your work, your neighborhood…and your family. The family culture is your set of family traditions, attitudes, and customs. These are the things that make your family unique. 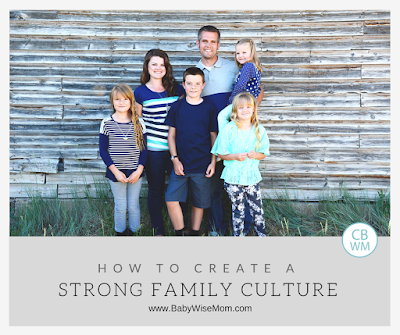 A strong family culture can bind your family together. You create a “we” that your children can hang on to. When you have a family culture, your children know what to expect in life. They know what you expect from them. They know the values that are present in your home. They have a sense of belonging and an understanding of self. Having a family culture brings to our lives consistency. Each piece of family culture is like a brush stroke on a large painting. Each thing is but a moment. Those little moments work together over time to create a masterpiece. “In my office is a beautiful painting of a wheat field. The painting is a vast collection of individual brushstrokes—none of which in isolation is very interesting or impressive. In fact, if you stand close to the canvas, all you can see is a mass of seemingly unrelated and unattractive streaks of yellow and gold and brown paint. However, as you gradually move away from the canvas, all of the individual brushstrokes combine together and produce a magnificent landscape of a wheat field. Many ordinary, individual brushstrokes work together to create a captivating and beautiful painting. McKenna was only a baby when I first heard that story nearly ten years ago. It is one of those pillar stories I cling to as a parent to remind me that the small and simple things matter. They add up. They may seem trivial in the moment–only one minor stroke–but they will create something beautiful in the end. If you are going to create a strong culture, you need some traditions. I grew up in a family culture, both immediate and extended, that was dependable. We had the same exact foods at Thanksgiving every year. The family reunion was the same weekend each year with the same format. I always knew what to expect. Now, we don’t want to get stuck in a rut and unwilling to branch out and change; however, we also don’t need to bounce around from tradition to tradition in search of some ideal that doesn’t exist. In our modern world, we can see the traditions and fun of everyone we know on social media and everyone we don’t know on Pinterest. Those can be great sources for ideas, but they do not need to drive us to chase after something picture-perfect. A tradition is something you do over and over. It doesn’t have to be all new every time. The love and warmth that comes from a tradition is not necessarily wrapped up in what the tradition is. It is the fact that it is a tradition. It is reflecting on those consistent moments in time and looking forward to what we know is “we” that helps us feel loved and united. Traditions aren’t just something we have at holidays and major events. You might have weekly traditions; for example, I know of families who have pizza and a movie together every Friday night. You will also have daily traditions. For example, we have a tradition to read family scriptures together each night and say a family prayer. Your bedtime routine is a tradition. Traditions don’t have to be amazing to be a tradition. Remember, you are making small brush strokes on the canvas of your child’s life. You also want to have some rules in your family. Have these rules be known and understood. Reinforce your rules and expectations in the little moments of your day. This is where those little moments of tradition pay off. Family dinner each day together gives time for conversation. Talking while you do your daughter’s hair instead of letting her watch YouTube gives you time for conversation. Keeping the DVD player off in the vehicle when you run kids from place to place allows conversation to be had. One-on-one dates with children opens up plenty of time for talking. “That isn’t how we talk, sweetie. We speak kindly of others.” Use “we” statements with your children. Have family mantras. I grew up by a hard-working family and something I heard over and over again from them was “Wasdens work!” The parents said it, the kids knew it, and the kids repeated it as they got older. That was a family mantra for them and they lived by it. What are some values your family holds high? What do you want to live by? Family history is also a strong way to build a family culture. Share stories from your childhood. Share stories from when your children were young. Share stories of your parents, grandparents, and beyond. Get those stories from your oldest living relatives (and all older relatives). In my dad’s family, family history is huge. At our reunion each summer, my dad and his siblings would (and do) tell the same stories over and over and over again. As teenagers, we were thoroughly annoyed. We had heard it all a thousand times! As adults, we love it. We can’t wait to hear, again, all about their lives growing up and their funny stories. My children love to hear stories from my childhood, my husbands childhood, and their own lives before they can remember. They love to hear about their births. They love to hear the funny things they said as toddlers. They love to know when they hit milestones. I have life histories of relatives who lived more than 150 years ago. I love their stories of their faith. I love to read about their interests and talents and see what I have in common with them. I get an idea of why certain values are strong in my family. Knowing family history helps you realize the impact your life has on your posterity. You realize life is so much bigger than just you. It helps you feel a sense of belonging. Go through each holiday. What tradition did you love as a child? What would you like to continue? What would you like to change? What new ideas might you start to make the holiday your own? What will your family evening schedule be like? This is a simple way to build family tradition. Will you eat dinner together? Will you have family activities? Will you do chores? When will bedtime start? Decide on a bedtime routine. What will your family traditions be for bedtime? Will you pray together before bed? Will you read scriptures? Will you read books or stories? Will you watch a show? Will you do baths? This is a huge part of family culture since it happens every single day. Decide on some possible weekly and monthly traditions. You might have some fun ideas that will happen on a weekly or monthly basis. Dates with kids. Dates with your spouse. Movie night. Game night. Breakfast for dinner night. Watching sports. Visiting family. Going for hikes. Decide on some rules and policies. What will some of your family rules and policies be? Will you expect your children to treat each other a certain way? Will you participate in extra curricular activities? If so, will you require children to support each other in those? 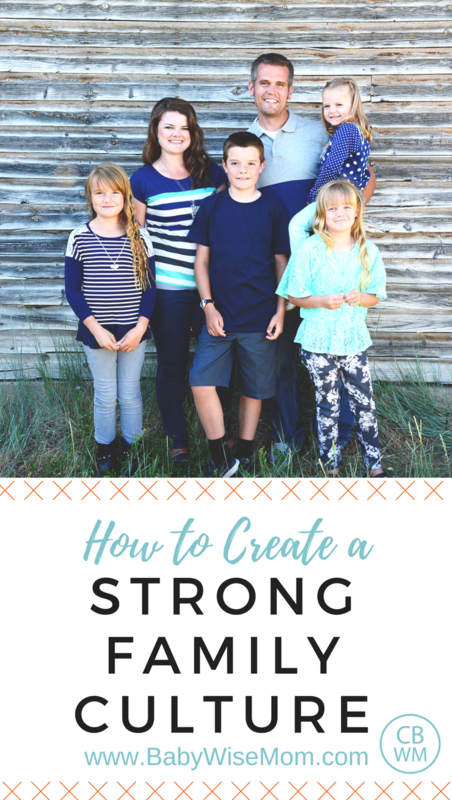 A strong family culture and traditions are a powerful way to strengthen your family so it is able to withstand the hard moments and you can all stay unified. Every family has problems. Every family has disagreements and arguments. Not everything is roses. A strong family culture helps you all to have something you belong to that outweighs the bleak moments. The good is stronger than the bad. The effort is constant. It is easier to do nothing; however, the results are worth all of the effort in the world.